Microsoft is all ready to show off its new Surface devices and the latest version of its desktop operating system. The company is holding a media event tomorrow in New York City that is expected to focus on the Surface Laptop 2, Surface Pro 6, Surface Studio 2, and upcoming Windows 10 features. While the public release of the upcoming Windows 10 October 2018 Update isn’t likely for tomorrow, the company will certainly use the attention to talk about where the Windows world is heading. Since introducing us to the Windows as a Service model, Microsoft has gone from an aggressively ambitious strategy to a more mature one in the past year or so. The company has almost stopped with its incessant marketing strategy, giving users more control over when and how they install updates on their machines. However, this shift in strategy has certainly translated into Windows 10 market share staying stagnant for several months. Despite the looming end of service deadline, Windows 7 – arguably the most beloved desktop operating system – continues to reign supreme. While we had hoped that the new OS will top the charts this Fall, it now appears an additional few months might be required for that to happen. The latest stats from Netmarketshare report that Windows 7 sits on top with a 40.88 percent market share followed by Windows 10 at 37.44 percent. Looking at the upcoming Windows 10 version’s release and then the holiday season that brings with it some unbeatable discounts on PCs, Windows 10 could finally replace Windows 7 as the most used desktop operating system version. These two are followed by macOS version 10.13 at 6.08 percent, Windows 8.1 at 4.86, and Windows XP on 3.19 percent followed by a few versions of macOS and Linux. Microsoft continues to top the charts with its overall market share of 87.56 percent, however, it would certainly be worried by Windows 7 clutching to its top position. While Microsoft will be killing off Windows 7 support in a little over a year, users appear to be happy to stick with it until that happens. 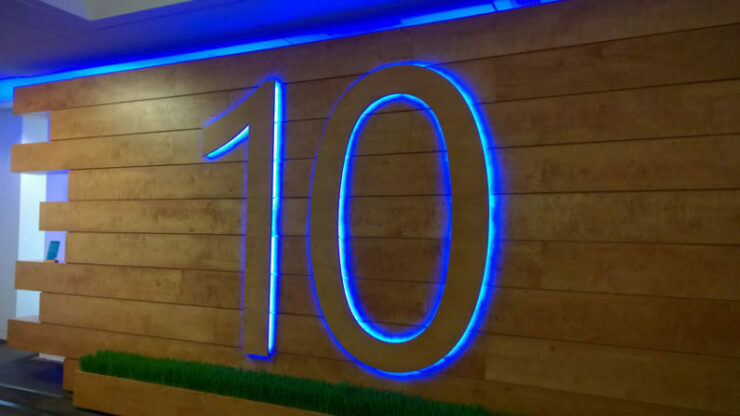 At least there is one good news for Microsoft – the company has managed to avoid the fragmentation problem with its latest Windows 10 updates, something that the Android world is yet to fix. Microsoft’s Windows 10 April 2018 Update, despite its fair share of issues, is already seeing nearly a 90% adoption rate followed by its predecessor, the Fall Creators Update, having only a 5.7 percent share, confirming that those who have made the jump to Windows 10 are ready to install all the latest versions without any long delays. Let’s see if Microsoft continues to keep its Windows 10 users happy with these frequent feature and performance improvements.